The Co-operative Bank of Kenya has given a Ksh. 20 Million boost to the First Lady’s Maternal and Child Healthcare Half Marathon initiative. The First Lady’s Half Marathon is to be held on Saturday 10th March 2019, to raise awareness and galvanise support towards maternal and child health. This latest Ksh 20 million contribution is the fourth such donation by the Bank, which brings the cumulative contribution by the Bank to over Ksh57 million donated in the last 5 years. The sponsorship has supported, among other needs, the purchase of three brand new fully-equipped mobile clinics which were donated to Narok, Nandi and Kirinyaga counties. Since its inception in January 2014, Beyond Zero, on which the Half Marathon is anchored, continues to play a key role in the elimination of preventable maternal and early childhood deaths as outlined in the Beyond Zero Campaign. The success of Beyond Zero is well demonstrated by the progressive improvement in key maternal health indicators as well as HIV prevention and management. There has also been an increase in stakeholder participation and goodwill, all necessary for a healthy population. We greatly commend the First Lady for her bold declaration that she shall be on the frontline in the fight against HIV/AIDS to see a HIV-free generation in her lifetime. We are confident that if Beyond Zero maintains the current momentum, Kenya will be on its way to becoming a safe haven for mothers, children and adolescents where motherhood is enjoyed and children born AIDS-free. In this context, the Co-operative Bank is most proud to support the First Lady’s Initiative alongside other worthy causes that include the School Fees Bursary Program that has supported over 6,900 gifted but needy students, and capacity-building in the over 14 million-member co-operative movement under the Co-operative Bank Foundation. Presenting the donation at State House, Nairobi, the Co-operative Bank Group Managing Director & CEO, Dr. Gideon Muriuki commended the First Lady for her passionate effort and desire to make a difference in people’s lives. 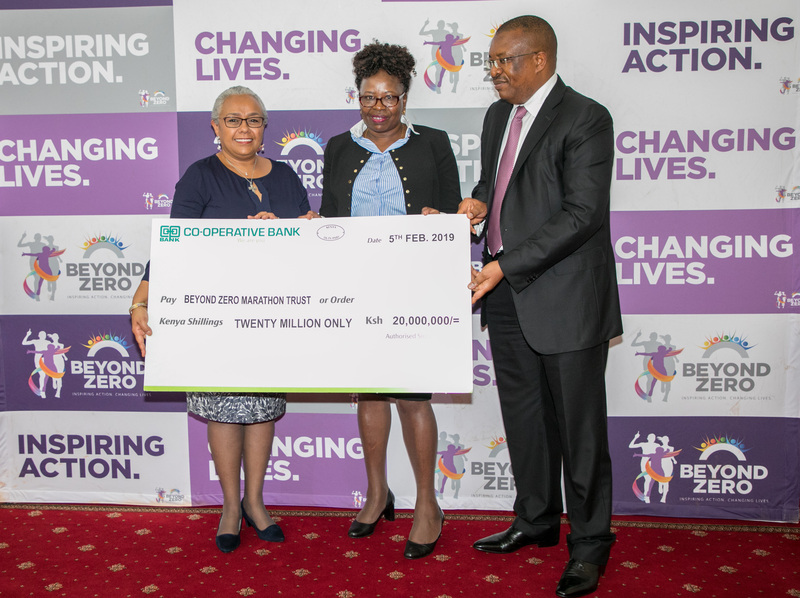 In addition to the cash contribution, the Co-operative Bank will send two teams to take part in the 2019 First Lady’s Half Marathon.